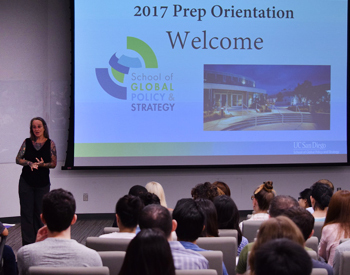 On Aug. 7, the UC San Diego School of Global Policy and Strategy (GPS) welcomed 166 new students to sunny San Diego. Although the official first day of class for fall quarter isn’t until Sept. 28, these students are getting a jump start to graduate school through the Prep Program. All course are designed to introduce concepts that will be used in the core classes offered at GPS. Math Camp is a nine-day course that reviews algebra and calculus concepts, and is often followed by Quantitative Methods (QM) and an economics course. The analytical writing course focuses on critical reading, analytical thinking and writing, evidence choice and use, and proper citations, as well as proper use of intellectual property. Finally, the GLI Academic English course is designed to prepare international students for graduate-level classes, and to instill confidence in everyday English speaking and listening skills. “Prep is helpful, not only in refreshing knowledge previously acquired, but in gaining exposure to new topics that are going to be relevant to the coursework that will be undertaken in the fall. It also gives you a chance to meet your peers and establish friendships and connections that help to integrate you into the community,” said Meghan Ramsey, a 2019 Bachelor of Arts in International Studies and Master of International Affairs (BA/MIA) candidate who is attending this year’s program. Also attending this year, 2019 Master of Public Policy (MPP) candidate Hector Zaragoza who shared that the program has been an invaluable experience. It not only gave him a sneak preview of actual course material to come, but it also allowed him to be aware of what will be required to be successful in the program. Zaragoza added that the time also helped him to become familiar with his future professors like Teevrat Garg who taught the QM course and Gordon McCord who taught the economics course. The School’s Career Orientation Program (COP) is designed for incoming students to get a jump-start on achieving their ultimate career goals. Held two days a week during the Prep Program, new students receive a wide variety of topical training, including key planning for early fall deadlines for many internships and jobs. Some COP session topics includes resume writing; how to craft the best cover letters and branding yourself; key networking strategies; sectors overview and hiring timelines; internship and job searching skills; creating a successful LinkedIn profile; engaging with alumni and employer outreach; professional development and etiquette; and much more. 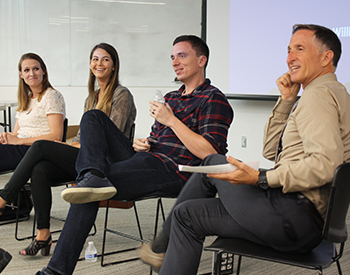 In addition to Career Services team members working with the students, more than 20 alumni came back to campus to impart their wisdom. Boomhower added that whether it's individual sessions like “how to dress for success when interviewing” or hearing from a group of alumni employed in the private sector, the insights are powerful. It is wonderful seeing students ask questions and have meaningful dialogue with our alums. 2019 MIA candidate Cheng Chen explained that in China’s undergraduate education there is a lack of career-planning curriculum, and as a result students are not as prepared to build networks with alumni to find internships or jobs. After realizing these things, all the content and useful skills COP offered left her thirsty to get a more specific “career plan” in place now. “At the end of this class, I was even inspired to email the dean of my undergraduate school in China to share my own feedback, and encouraged them to have more career service classes," said Chen. In fall of 1994, Paul Cleary was looking forward to what would likely be his last academic experience. During that year’s orientation, he found himself in a room full of very smart people, including his future wife and fellow 1996 alumna, Tiffany Vandeweghe Cleary. The program was very rigorous, fast paced, with a lot of reading, and I hear much hasn’t changed he remarked before a group of new students during this year’s Prep Program. He went on to explain how he had spent several years gaining nonprofit experience on the ground in Guatemala, working on a rural electrification project before applying to graduate school. He had every plan to return to Latin America and felt a degree from GPS would help him achieve his next career goal. “For many of us the computer lab was the first place we surfed the web and signed up for a new AOL email account. It was also the first time I wrote a paper on something other than a typewriter,” he said. It was also a time when California was getting very serious about renewable energy back in the 1990s, the disappearance of the Ozone layer was a real worry. “In 1996, Governor Wilson signed into law a bill designed to deregulate the state’s investor-owned utilities and create incentives for solar systems under the Renewable Energy Program,” said Clearly who is now a leader in the solar energy industry, which twenty years ago didn’t really exist. He serves as executive director of GRID Alternatives San Diego, a company whose mission is to bridge the solar divide by bringing solar energy to low-income families who couldn’t otherwise afford it, while training the green workforce of tomorrow. Cleary shared that he and his family have been happy consumers of solar-generated electricity since 2002. 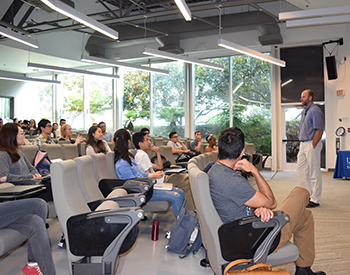 After a lengthy Q&A session with the students about energy and environmental policy, Cleary closed the session by imparting a few final lessons learned along the way. Although QM is still as vital today as it was 20 years ago, much has changed. The School has a new name, there is now a MIA degree and many of the tracks have changed. Back then my career track was Comparative Public Policy, and now there is a whole new public policy degree Cleary added. View more photos from the 2017 Summer Prep Program.